Our pop up display store offers the largest selection of pop up displays anywhere. You can shop our collection by shape, size, colors and graphic options and accessories. We also sell modular displays and trade show products to help you standout at your next trade show. Our products are made with superior quality construction giving you a reliable and reusable display for years. Our pop up displays and banner stands are easy to setup for use at trade shows, point of purchase, marketing, advertising and presentation event. We provide you convenient design options to help you personalize you pop up display with your brand and desired look. Majority of our pop up displays, banner stands, and modular displays are proudly made in the USA. Relaunch of our store means extra savings for you. Subscribe to our newsletter or call to get extra $50-$100 off our low prices. Superior Quality, Huge Selection, Multiple Colors, More Options and Dazzle. Many items made in the USA. 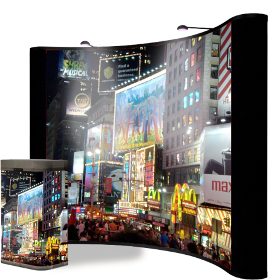 The biggest cost saving opportunity of any display is rush fees and shipping. We can help reduce rush and shipping fees. Call or write to us.